Remember the Rudbeckia laciniata that I just posted about? 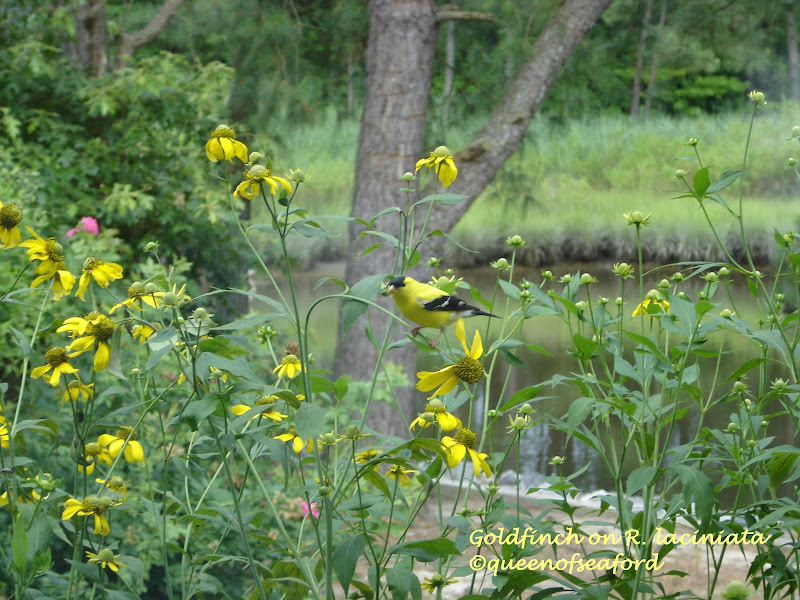 Well, now that it is in bloom there are Goldfinches galore on it. This was taken from the family room, about two feet away from the finches. These little birds are a bit skittish, when I walked up to the window there were about four of them on the plant. Only one remained. They love this plant. Always a flurry of yellow! What a show! See how the stem is bent over with him sitting on it? Cephalanthus occidentalis, Buttonbush is a butterfly and honey bee magnet. 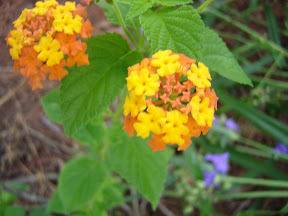 A native, this plant thrives in full to partial sun, zones 4- 10. A wonderful tall shrub for riparian and wetland environments. It gets to be about 10- 15 feet tall and is deciduous. 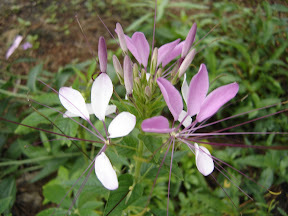 This specimen is in the York County Learning Garden in our Wildlife Area. There is a dry stream bed that during rains fills very quickly, the Buttonbush is next to it. As you can see butterflies love these Sputnik shaped flowers. 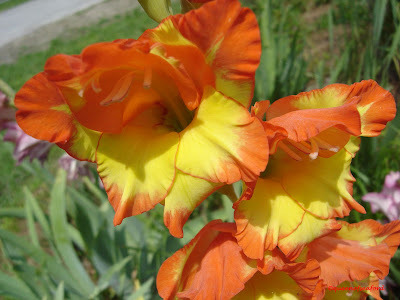 Truly a bonus in any garden! Next we have the Chaste Tree or Vitex agnus-castus. Those of you who read other blogs may have seen this posted on Racquel's posting from the other day. 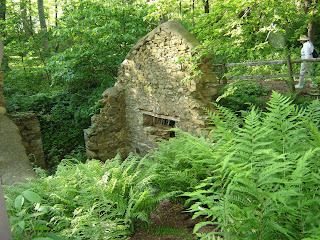 This one is also in the Learning Garden, also in the Wildlife Area. Another deciduous tree --this tree's blooms attract bumblebees, butterflies and hummingbirds. It will get up to about 15 feet tall, careful pruning will lend itself to a wonderful structured tree. This tree needs full sun for the blooms to really shine. 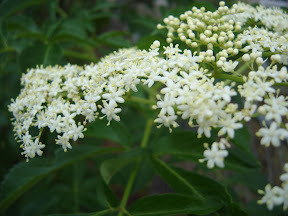 If you don't want a woody shrub or small tree but want to draw the birds and butterflies into your yard, this perennial might be your cup of tea. Common name is Green Coneflower or Rudbeckia laciniata. It too is a native. 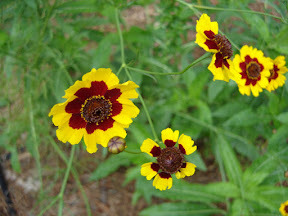 The Goldfinches as well as other seed eating birds love this flower. 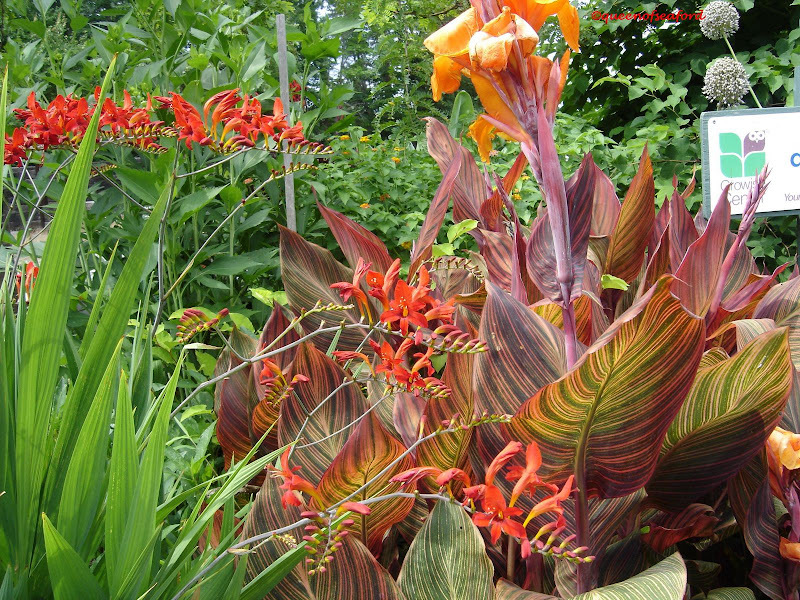 This is a herbaceous perennial and leaves only a basal set of foliage in the winter. I have this growing outside my family room window looking through it to the water. 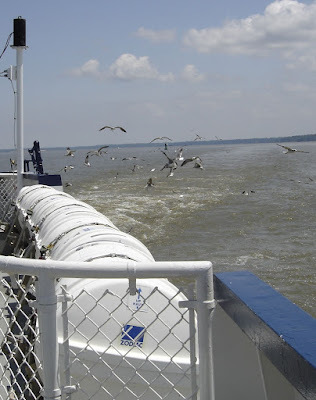 It is apparently not bothered by the brackish water when we have high tides. It likes full to partial sun. As with many of my flowers in my garden, I leave the spent seedheads on the stems for the birds to enjoy. See the pinkish circle at the top? That is the bloom-- so from inside it is right at eye level. This can get up to 12 feet tall. OH do the finches love this!!!! Aren't these colors great together? Crocosmia and Cannas with Lantana in the background. Racquel and I went down to Smithfield Gardens yesterday to meet Les and Helen. We got there early and shopped for a while and checked out many of the display gardens. Racquel and I had planned on driving over the bridge and seeing Les with no date in mind when Helen said she was visiting Les on Monday and could we meet. 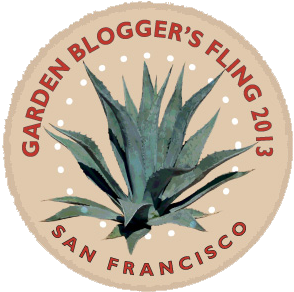 After a lovely tour of Racquel's garden (it looks just like it does in her blog! Perfect!) 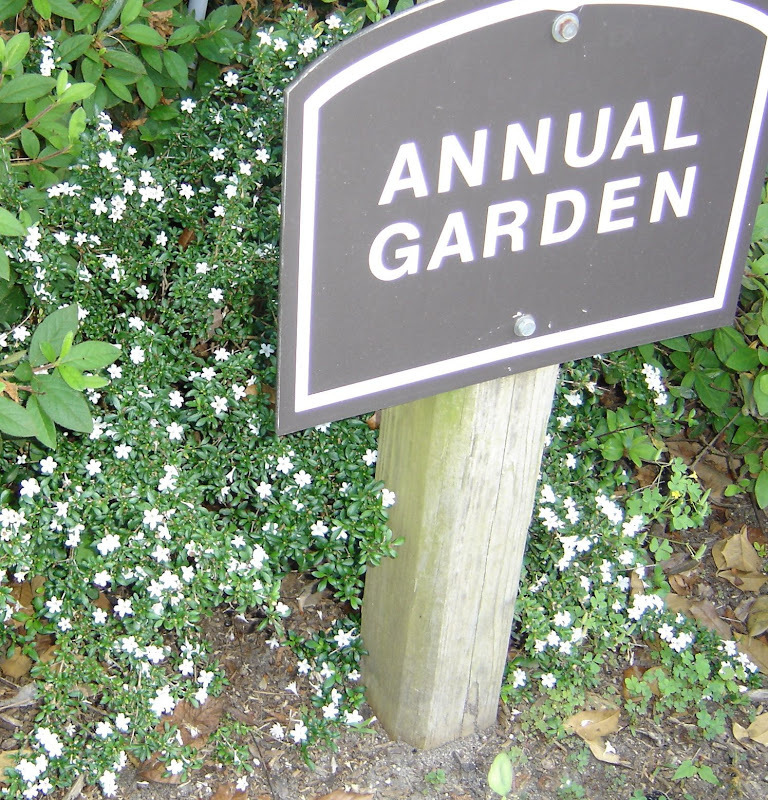 we drove to Smithfield Gardens in Suffolk, Virginia. We walked around and ooh-ed and aah-ed over lots of plants and then the display gardens. Love the hot colors in the picture at the top of the page. When I went around to the other side of the bed to see more of these hot colors there was a Hummingbird zooming from one bloom to another. 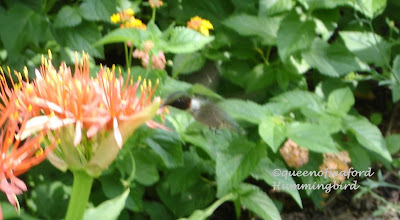 He was going so fast, but I did catch a blur!! 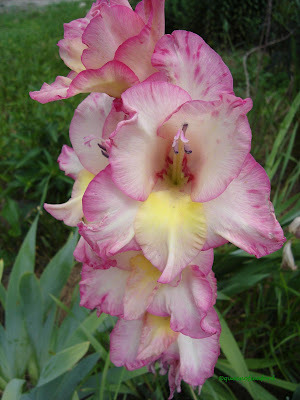 I love Gladiolas but have too many voles to grow them successfully. After Racquel and I made our purchases Les and Helen drove up. We got a guided tour from Les. It was nice to meet both Les and Helen. I believe Helen will be blogging about the visit (with photos) on her blog. I am the good looking one. ?!?! 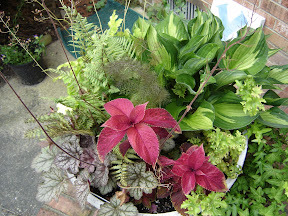 Helen asked an interesting question-- What kind of garden do you have? Hmmm...? Messy? Haphazard? laissez faire? Interesting question. I am not sure, perhaps one that attracts birds and butterflies? with fragrance and color? Will have to get back with a better answer----- one of these days. 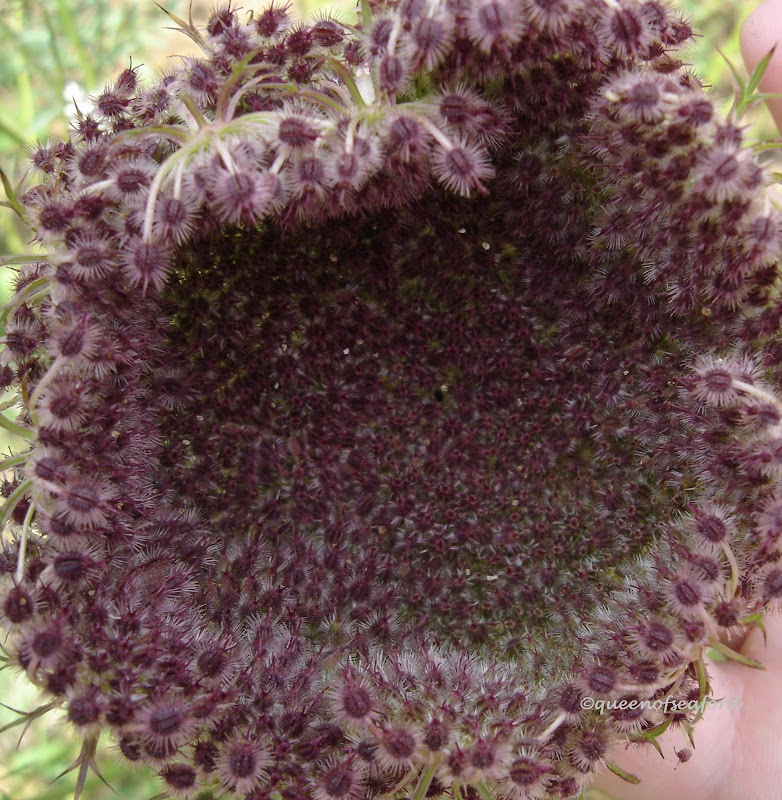 Les shared some seed heads with us---this is one still on the plant...............know what it is?? Yes,Daucus carota -Queen Anne's Lace. I love how it looks red/pink as it ages. A grand day all around!! Thanks Racquel for driving, and great meeting Les and Helen. This is one plant that not many people have heard of, yet it is such a sweet little shrub, I wonder why more folks don't have it? If you Google the name, many of the websites are about the Serissa in conjunction with Bonsai. Here is a good write up for the Serissa. 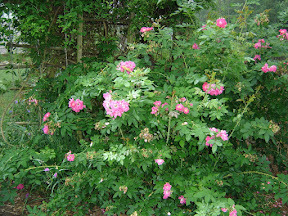 We have a couple in the Learning Garden and they are in the edge of the wooden area near our azaleas in part sun. It is in bloom from early spring until fall with tiny white trumpet shaped blooms. 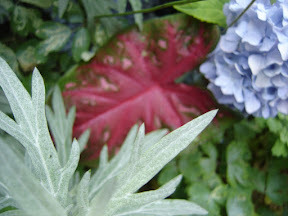 In our area it is semi-evergreen according to what I have read though these seem to retain their foliage. They are hardy from zone 7-9 (or 11 depending on which website you read) and there are white blooms, pink blooms and a double white. 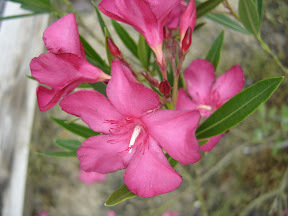 It is a small shrub, barely getting 24 inches tall. 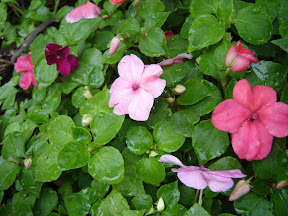 Dark green leaves (which in my garden remain year-round) and a constant show of tiny blooms. 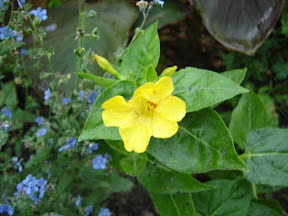 A sweet shrub to have in any landscape. For those of you who read a lot of the blogs about the Spring Fling you may have read "Our Little Acre" written by Kylee. Well she and a few others collected a lot of the goodies from the Spring Fling and offered up a chance to those of us who didn't go to Chicago to win some garden SWAG (Stuff We All Get). I quickly opened the package and found all sorts of goodies. What a treat! I have four packets of seeds- Phlox drummondii 'Coral Reef Blend', Alchemilla mollis 'Thriller' (Lady's Mantle), Radicchio Carmen Cichorium intybus, and Nasturtium officinale Watercress. Two books, can't decide which to start reading first! Waking Up In Eden by Lucinda Flesson and The Garden of Invention by Jane S. Smith. 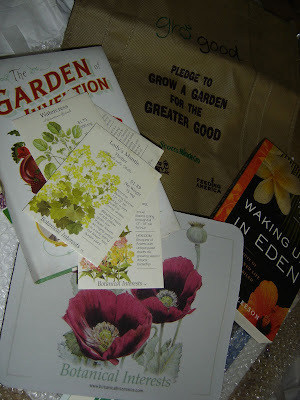 There was also info on garden produce sharing (Plant a Row for the Hungry, gro good, Scotts MiracleGro, Feeding America), a coupon and a magnet from Garden Guys, a cloth shopping bag, a coupon for free shipping from Botanical Interests Seeds, a computer mouse pad with poppies on it and a very nice note from Kylee. Thanks a bunch!! What a nice treat...Kylee and others who put all this SWAG together...thanks. 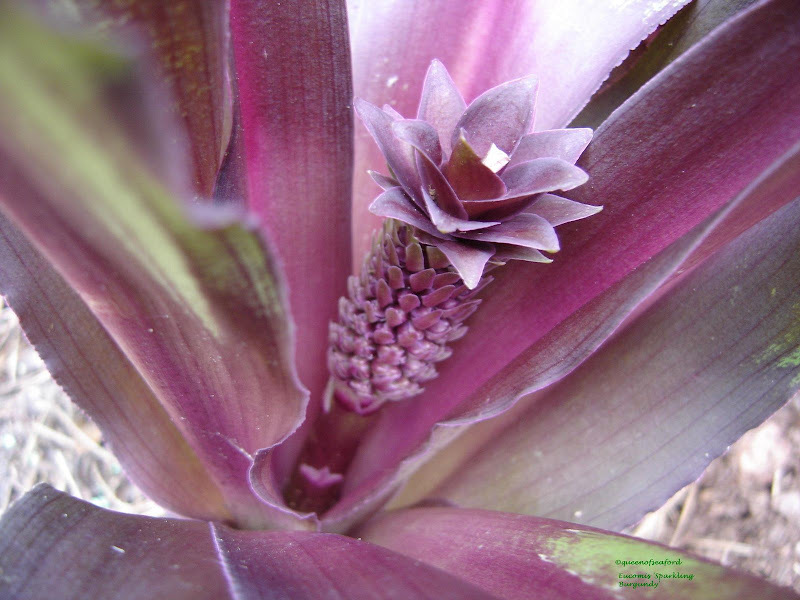 While working in the yard yesterday I saw a tiny pineapple emerging from the center of the Eucomis 'Sparkling Burgundy', Pineapple Lily. It is so cute. 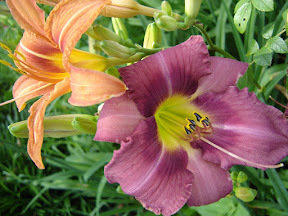 I am sure later in the season I will laugh that I considered this the bloom. I know it will get larger and more grand..but for now it is a cute little pineapple. Many thanks to Frances for a little explanation about marking one's photos. 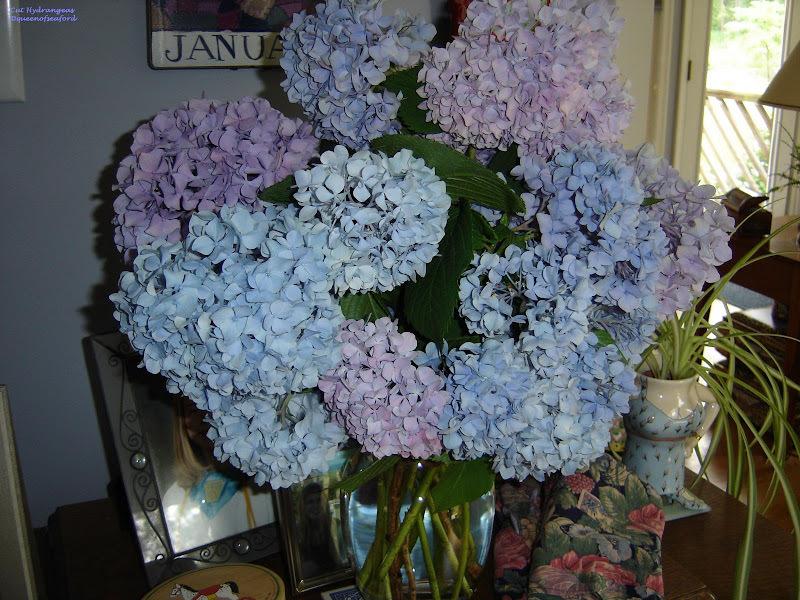 One of the Hydrangeas is in front of the hose spigot and with the rain, the blooms were heavy and leaning over. I decided to cut just enough to get to the spigot. What a grand bouquet! 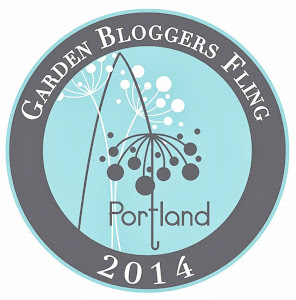 Happy Garden Bloggers Bloom Day. 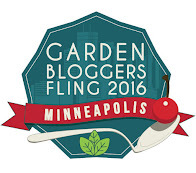 Please visit Carol at May Dreams Gardens to see all the bloggers who have listed their sites for today. With so many plants from which to choose, I will keep words to a minimum. Remember the rose bush I pruned last winter? She is blooming up a storm. All photos can be clicked on to enlarge. 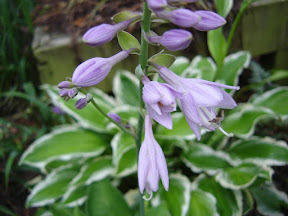 Hostas are all putting up their flower stalk. Oleander and Elderberry in the backyard. 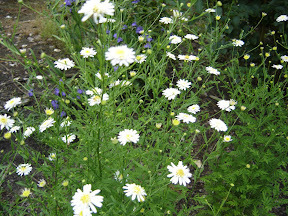 Cosmos and Cleome in what was once the vegetable garden. I bought a box of 50 Caladiums, thought most were Vole food, some are finally showing up and Impatients that have reseeded many times over the years. 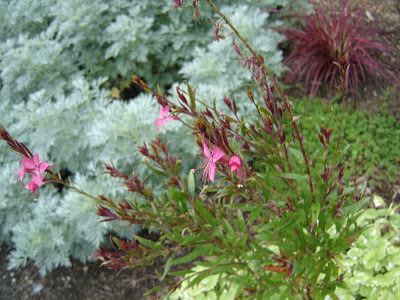 This is a container at the end of the driveway with Gaura and Glechoma hederacea, on the ground behind is Sedum 'John Creech' Artemesia 'Powis Castle' and the Pennisetum 'Fireworks'. If only you had smell-o-vision today..Dianthus 'Old Spice' wonderful! 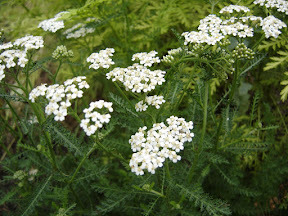 Achillea in bloom. 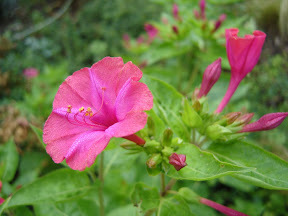 A couple Four O'Clocks still open this morning. The Yellow one in front of a bunch of Forget-Me-Nots. More of the Japanese Asters blooming with the Spiderworts and an update on the front porch containers. 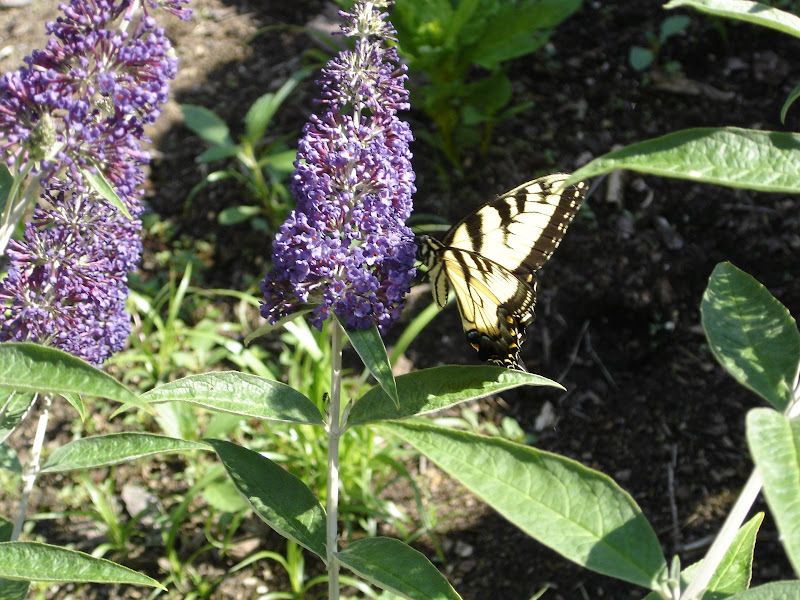 Yesterday as I was surveying the front garden I noticed a Eastern Tiger Swallowtail, Papilio glaucus Linnaeus on my Buddleia. 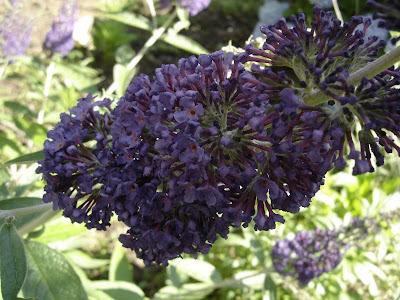 Since Cameron has the same Buddleia and wondered about color, I thought I would share. The Adonis Blue is really a nice compact Buddleia. Mine has been in ground for a few years. Too often I find my Buddleia get leggy and needing constant deadheading. 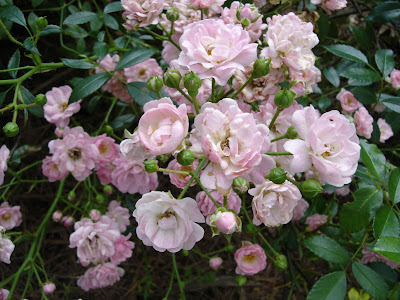 This one is so much nicer to have, little deadheading and nicely branched limbs, keeping it full and compact. 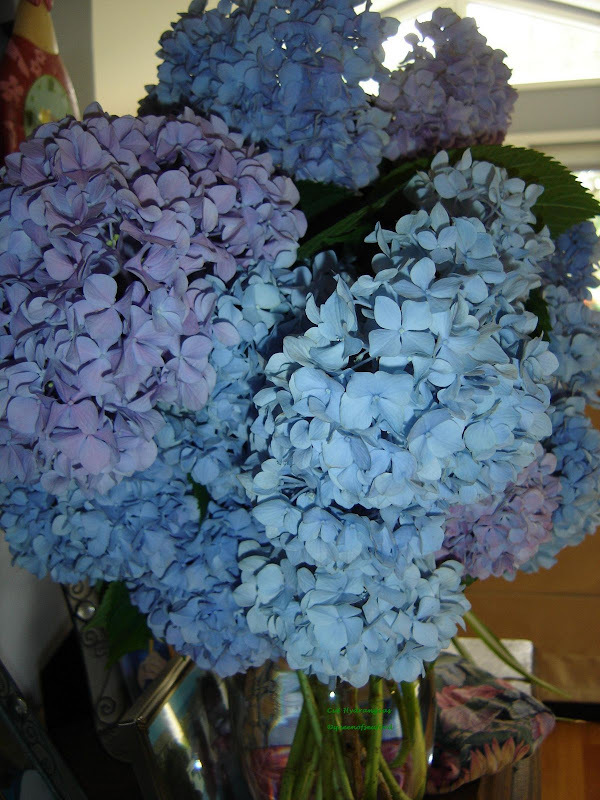 Also nicely fragrant! 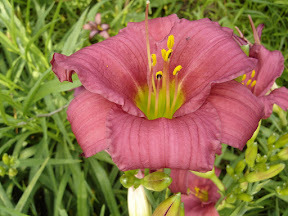 Here is a close-up of the bloom. This bush is in a very blue area of the garden. 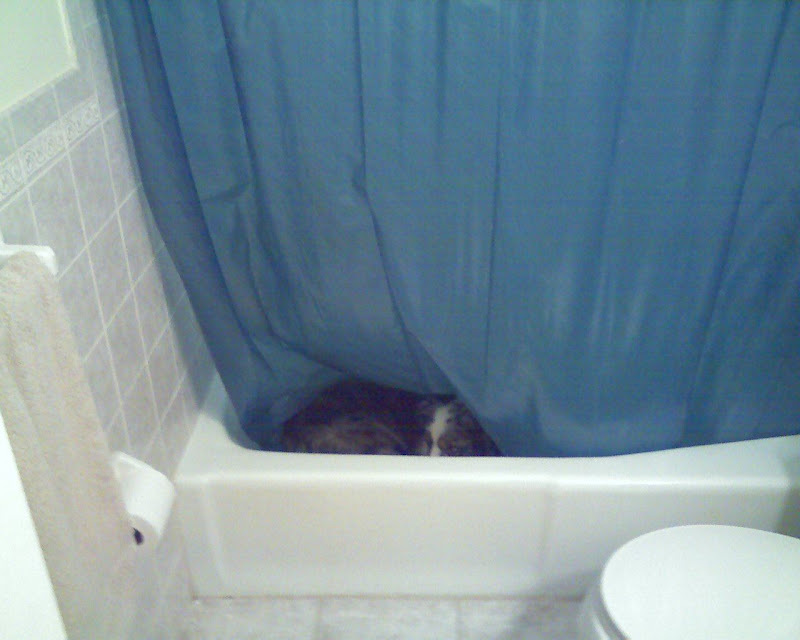 I didn't realize it until I took the picture. 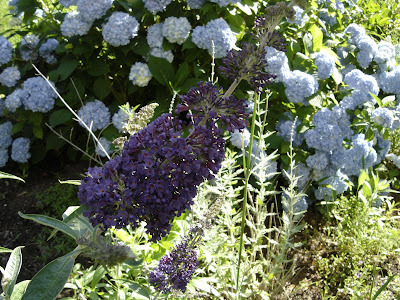 There is a Nikko Blue Hydrangea, Verbena bonariensis, and Perovskia atriplicifolia 'Russian Sage'. 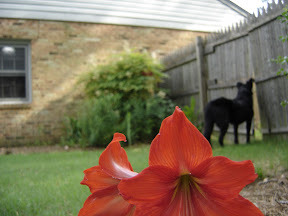 Yes I know the song is "Amarillo By Morning" but every time I mention that my Amaryllis is blooming, my husband starts singing "Amarillo By Morning". We have a little game we play in our family....plant the ear worm (for lack of a better name). The challenge is to be humming or singing a song early in the day, then later in the day when you return from your day's activities, see who is humming/singing the song you 'planted'. 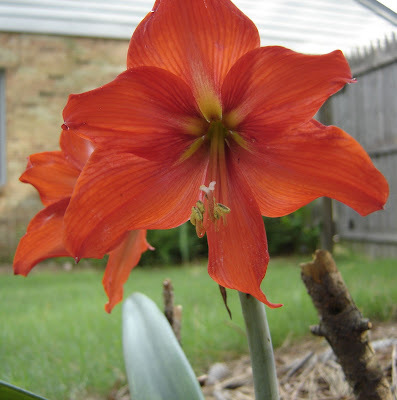 Here is my Amaryllis, variety unknown-- a Christmas-time purchase. I put some sticks around it in the ground to keep the dogs from stepping on it as it emerged this spring. I put it in the ground late winter a year ago. There was foliage last year but no repeat blooms. 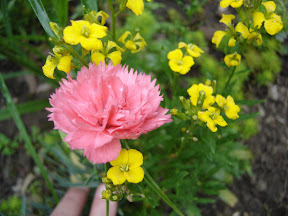 Here is 'how-not-to' take a picture of a low growing bloom.....the flower is facing a pine tree so there was no getting in front of it to take the picture. 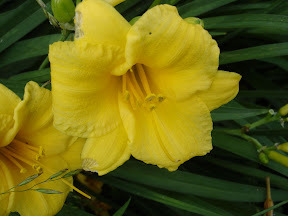 The backyard has a number of Hemerocallis, some varieties are pass-alongs, so who knows what they are. Others include Stella de Oro, Grape Business, and Little Business. 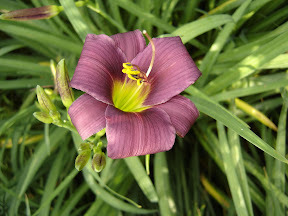 An added benefit of the Hemerocallis family- it is salt tolerant. 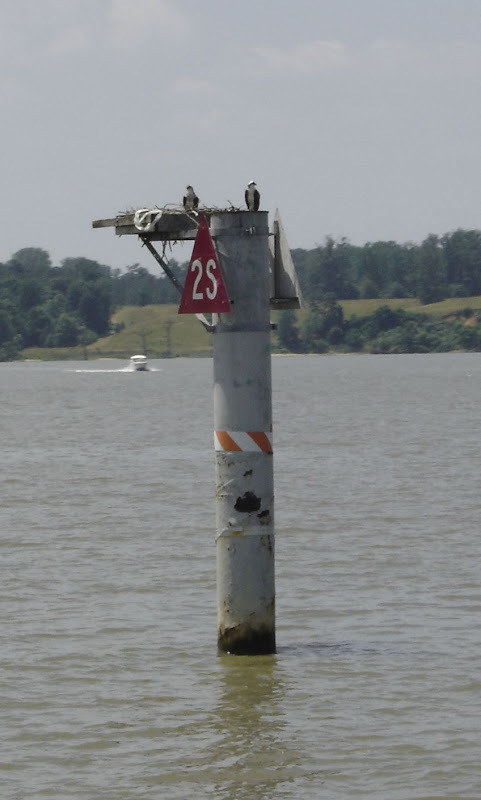 These are in the lower part of the yard where we get tidal flooding on occasion. The 'Fairy' rose is blooming its heart out right now.